You can contact the school in many ways. It is a busy facility, so please review the information below to ensure you are directed to the right contact within the school. Please note: Tickets for TCAT shows are not available on the THS site. Tickets can be purchased from the theatre website (with no booking fee) or from Tiverton Tourist Information or The Busy Bee, Fore Street, Tiverton. All of our tutor groups have their own email address. We have 6 Houses (Barle, Culm, Dart, Exe, Lowman and Otter) and each tutor group within each House is numbered e.g. Barle 1, Barle 2, Barle 3 etc. The email addresses follow the same pattern barle1@tiverton.devon.sch.uk, barle2@tiverton.devon.sch.uk, barle3@tiverton.devon.sch.uk and so on. Please contact accounts@tiverton.devon.sch.uk for any accounts queries. Please email admin@tiverton.devon.sch.uk for general school enquiries. Please email attendance@tiverton.devon.sch.uk to report an absence to the attendance office. As from the 1st September 2013, all schools are unable to authorise any requests for absence relating to holidays in term time. This has been brought about by an amendment to the Education (Pupil Registration)(England) Regulations 2006 which has removed reference to holidays and the ten day period. These changes reinforce the government’s view that every minute of every school day is vital and that pupils should only be granted authorised absence by the school, in exceptional circumstances e.g. illness, exclusions, or due to other unavoidable causes. This view has recently been reinforced by Ofsted who in a recently published report on a Devon school reported, “Pupils clearly enjoy being at school. However, overall attendance is no better than average and this is in part due to some pupils being taken out of school for holidays during term time by their parents, in spite of the fact that the school has a clear and published policy that makes it clear that such absence is unauthorised. This absence has an impact on pupils’ achievement. As a result, the overall judgement for behaviour and safety is good rather than outstanding”. We would remind parents that unauthorised absences may well result in the instigation of parental responsibility measures which could be a penalty notice, or a fine of up to £2,500 and/or a term of imprisonment of up to 3 months. We hope you will support your child’s school by ensuring that your son/daughter obtains the maximum benefit from their time at school by attending punctually for the 190 days each year that the law requires, unless prevented from doing so by an unavoidable circumstances. For help or advice at any time before, during or after the exams series please contact the school’s Exams Office. Alternatively your student’s teacher, Subject Leader, Head of House or Student Support Services will be able to help … in fact everyone at the school is here to help! Ask for extension 263 or contact us by email. Alternatively use the contact form here. What to do if you suspect a child or young person is at risk? Someone tells you something has happened or is happening to them which could be abuse. 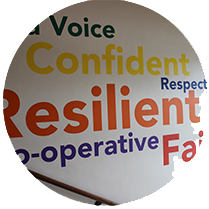 Within school the Designated Safeguarding Lead is Caroline Warren (Head of Student Safeguarding) and our Deputy DSL is Kerrie Butler (Family Support Worker), please feel free to contact the above staff on 01884 256655 or safeguarding@tiverton.devon.sch.uk to discuss any concerns. Out of hours please call 0845 6000 388. If it is an emergency dial 999.